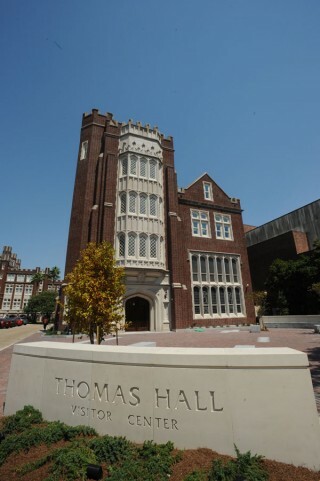 The recently-renovated Thomas Hall has achieved LEED Gold Certification for its environmental sustainability components according to the U.S. Green Building Council (USGBC). LEED stands for Leadership in Energy and Environmental Design, a certification developed by the USGBC to set a benchmark for design, construction and operation of high-performance green buildings. LEED Gold is the second highest level of achievement by the USGBC and Green Building Certification Institute (GBCI). “This level of LEED attainment is no light achievement. It serves as confirmation that Thomas Hall is among the upper echelon of sustainable developments worldwide,” said Loyola President Kevin Wm. Wildes, S.J., Ph.D. Sustainable Site Development: The site was remediated of all asbestos and lead. Many opportunities for alternative transportation were adopted for the project including public transportation access, access for low-emitting and fuel-efficient vehicles and parking capacity. Water Efficiency: Native and adaptive plantings that require no irrigation were installed for 100% reduction of potable water. Water use was reduced by 47 percent by installing fixtures that exceed the conventional/required flow rates. Energy and Atmosphere: The building has realized an energy savings of 32 percent and an overall cost savings of 27 percent since its renovation. Materials and Resources: Twenty percent of materials within the building contain recycled content. Indoor Environmental Quality: Low-emitting materials were used to provide for the health and safety of the contractors and occupants. Built in 1911, the year before Loyola University received its charter, Thomas Hall was originally used as a residence and chapel for Jesuits and is named for Louise C. Thomas who funded the construction in memory of her late husband Stanley O. Thomas, a cotton broker. The historic building’s $11 million renovation repurposed it as a resource and visitor center for students and prospective students. The building now offers students a one-stop-shop administrative hub, housing the Offices of Admissions, Student Records, the Bursar, Financial Aid and Student Finance.